I was thrilled when Missy announced this month's ingredient was sweet spreads because I have two jars of Biscoff spread in my pantry! I ordered them from Amazon to make a cookie recipe from Two Peas and Their Pod and wasn't quite sure what to do with the rest of it (well besides eat it by the spoonful straight from the jar). But it didn't take me long to find a fall inspired recipe to try! 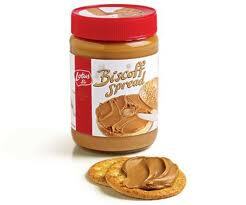 Biscoff spread is made from Biscoff cookies and has a sweet cinnamon flavor. If you don't have Biscoff spread at your local grocery store, I'm sure Trader Joe's cookie butter would do the trick for the purpose of this recipe. This fully loaded pumpkin bread is really good with a smear of cream cheese on it! Preheat your oven to 350 F. Grease two bread loaf pans. Combine all dry ingredients in bowl and stir to combine. Combine all wet ingredients in a bowl and stir to combine. Mix wet and dry ingredients until combined - do not over mix. Pour mixture into two loaf pans that have been sprayed with cooking spray and lined with parchment paper. Bake both loaves together for approx 50-65 minutes or until knife inserted into center of loaf comes out clean. Drizzle Biscoff glaze over each loaf. Stir the glaze ingredients over low heat until soft and creamy. Spread over your pumpkin loaves. ohmygodyum. I want some of that right. now. If there's any left, I'd like to try a slice this weekend! Yum! Good call making it seasonal with the pumpkin too.